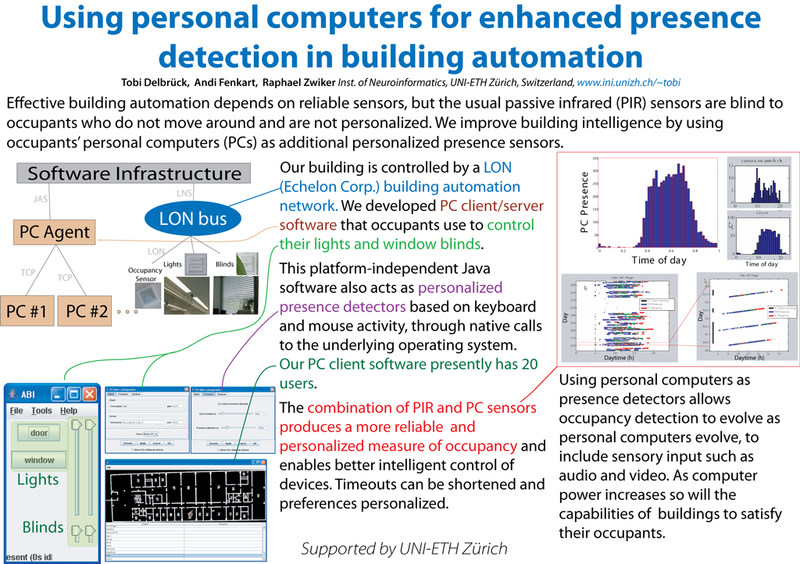 INI has worked closely with Josef Joller and his students from the University of applied Sciences in Rapperswil (HSR) since about 2002 on adaptive building automation, using INI's installation of an Echelon LON (Local Operating Network) building automation network. The goal of this work is to apply machine learning to building automation, in order to better satisfy occupants and to reduce energy consumption. All our atttemts to actually "intelligently" control the building have been only marginally sucessful. The latest work shows signs of promise, but the stability of the entire system--including all the hardware components and the complexity of the sotware infrastructure--is a continuing problem and the need to avoid annoying behavior is so extreme that traditional methods of machine learning are very hard to apply. (See this article about the user of AI in gaming to read more about this basic problem with "stupid" answers sometimes delivered by AI and the difficulty of diagnosing the reasons.) The present learning controller is thus disabled, although users can control their devices from their PCs. In addition this work requires an almost religious devotion because the experiments take months of real user experience to evaluate. Here we give show a small part of this work (my contribution) on using installed PCs to enhance presence detection. This is an idea that I implemented in 2003 as part of the AHA and then later with my diploma student Andi Fenkart and with Raphael Zwiker in the ABI system. It is incorporated into the latest system from Stefan Nufer and Mathias Buehlmann. The slides of my lab talk in 2003 on enhancing presence detection by using PCs. T. Delbruck, A. Fenkart, and R. Zwiker, "Using personal computers for enchanced presence detection in building automation," presented at HCI International, 11th International Conference on Human-Computer Interaction, Las Vegas, 2005. Effective building automation depends in large part on reliable sensors. Installed passive infrared (PIR) sensors sense movement, so they are blind to occupants who are working at their computers. This deficiency causes the familar annoyance in automated buildings of lights that turn themselves off when they shouldn't and that stay on longer than needed. PIR sensors also are not personalized to individual occupants and so cannot be used for setting personalized room preferences. We are using the installed base of networked powerful personal computers as additional personalized presence sensors. Our building is controlled by a LON (Echelon Corp.) building automation network. We developed personal computer (PC) client/server software that occupants of our office building use to control their lights and window blinds. This platform-independant Java client software also acts as a personalized presence detector based on keyboard and mouse activity, through native calls to the underlying operating system. These peronsal presence sensors enhance the reliability and functionality of the installed PIR sensors. Our PC client software presently has about 20 users. Our PC server interfaces between the PC clients and the LON network and provides an enhanced presence signal that more reliably and efficiently controls the building's lights and window blinds. We show the user interface and the client/server architecture and show data collected from the PIR and PC presence sensors. We also used low power wireless Berkeley motes carried by normal occupants to provide an independent measure of actual presence. This data shows that using PC presence detectors significantly enhances the reliablity of presence detection, which indicates that the timeouts for turning off lights to save energy could be substantially reduced without affecting user comfort or acceptance of automation. Using personal computers as presence detectors means that presence detection capabilities will evolve as the computers evolve, to include sensory input such as audio and video. As computer power increases so will the capabilities of the buildings to recognize and satisfy their occupants.